Do you want to take better photographs regardless if you are using a cellphone or a DSLR? Then professional photographer and experienced instructor Dave Lund is your choice for our introduction to photography composition class. The Take Awesome Pics class is a single two hour class with an optional hands on “photo walk” for class participants. Class size is limited and classes fill quickly, be sure to signup early! Do you have a more advanced camera and want to learn how to take control of your camera, take it off of AUTO, and take the photographs that you have envisioned? The Take Control class is your exactly what you need. Dave Lund’s method of instruction is one of remembering a few simple way points instead of having to memorize technical details. His easy to follow method will have you taking well composed and exposed photographs of your vision by the end of the first class! The Take Control Class is 2 classes of instruction (two hours one night a week for two weeks) and a third optional photo walk for class participants. Take the photographs you really want! Learn how to take your everyday photographs of your family and children to the next level. Read and learn how to create vacation photos that your friends will be jealous of. Taking control of your camera is easier than you think and it begins with reading this book. 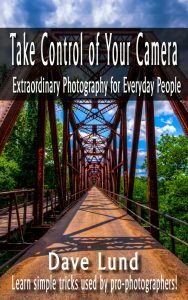 Take Control of Your Camera uses easy to understand examples and terminology to take the mystery out of how to use your camera to its fullest ability. An experienced instructor, Dave Lund uses easy to understand language and photographic examples to help understand how create photographs like the pro-photographers. Learning topics cover everything from camera choice to using depth of field and composition techniques that help transform your snap shots to gorgeous photographs worthy of being proudly displayed on your wall.